I think the black, white and yellow makes a really striking color combination for a card. This card was created with stamping the flowers and punching out with coordinating punch. All Supplies Stampin' Up! Daffodil Delight Cardstock 5 1/2" x 8 1/2" 1 Patterened Paper 4" x 5 1/4" 1 Basic Black Cardstock 2 3/4" x 4" 2 Daffodil Delight Classic Ink Basic Black Archival Ink Yellow Ribbon Stampin' Dimensionals 2 Whisper White Cardstock 2 1/2" x 3 3/4" & 2 pieces 3" x 3"
Fold Daffodil Delight 5 ½” x 8 ½” Cardstock in half to create card base and Adhere the patterned paper to the card front. Adhere the Whisper White Cardstock to the Black cardstock mat. 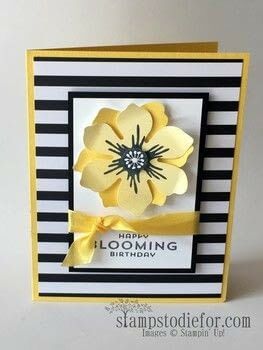 Stamp a flower with the Daffodil Delight Ink and punch out and adhere to the top of the Whisper White cardstock. Then stamp another flower with Daffodil Delight ink (but off stamp the stamp first – this means inking the stamp, stamp it on a piece of scratch paper and then stamp again for your project) adhere to the top of the other flower with a dimensional. Clean the flower stamp and ink with black ink and stamp the flower again and punch out the center with a ¾” punch and adhere to the center of the flower with a dimensional. Stamp a sentiment to the bottom in Black and tie a ribbon between the sentiment and the flower. Adhere the black mat to the center of the card front with dimensionals.